Europa displays a frozen record of strikes by Jupiter's thunderbolts in the recent past. Jupiter's thunderbolts preferred to run across the surface of Europa rather than through the near vacuum of space. If the ancient thunderbolt legends are taken at face value, then we are faced with the possibility that our neighboring planets waged celestial wars with thunderbolts in the time of human myth-makers. If this happened, what "smoking guns" should we expect to find? Jupiter's moon, Europa, offers an excellent example. The images above show a plasma ball as an electric discharge flows across it (top) and a view of Europa's scarred surface (bottom). Europa's rotation has been captured by Jupiter, so the same side faces Jupiter all the time. (The same is true of our own moon and the Earth.) The parts of Europa directly facing Jupiter and those exactly opposite are rugged and chaotic (hence the name chaos regions). These regions are where the thunderbolts struck and where they departed. 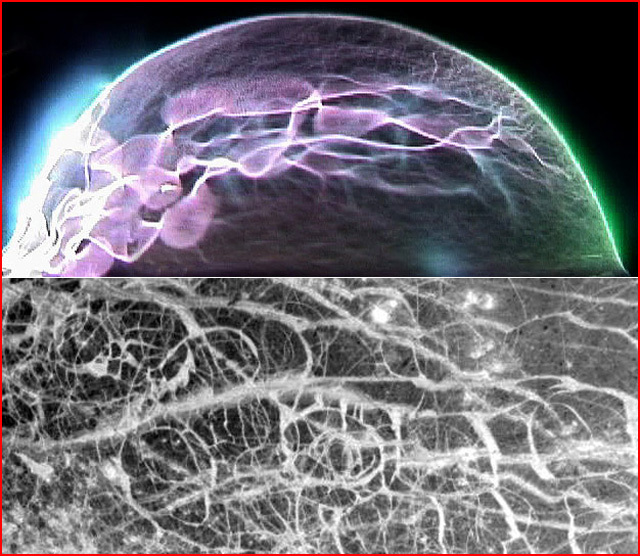 The surface areas connecting the two chaos regions (bottom image) are characterized by long, looping scars in patterns similar to those seen on the plasma ball. Europa displays a frozen record of strikes by Jupiter's thunderbolts in the recent past. Just as lightning looks for the easiest path to ground, Jupiter's thunderbolts preferred to run across the surface of Europa rather than through the near vacuum of space. The result is a filamentary pattern of superimposed furrows running this way and that for hundreds and thousands of kilometers across the face of the moon. Europa was not a target itself, but it bears the scars from being caught in the crossfire. Even if future missions to Europa discover continued "erosion" by tidal or electrical connections with Jupiter, most of the scars we see today were created in brief catastrophic episodes, not gradually at a uniform rate. As the surface lightning blasted its way across the moon, it heaped material to either side to form levees. It ripped across earlier channels as if they were not there. Jupiter's lightning was so powerful that it converted some of the oxygen in the water ice to sulfur--creating the dark coloration down the center and to either side of the large furrows. Europa is completely covered with this type of plasma scarring, and other moons are partially covered with similar patterns. Among them are Jupiter's Ganymede and Callisto, Saturn's Enceladus, and Uranus' Miranda. Continued study of these moons offers an opportunity to learn more about the recent electrical history of the solar system and our own human heritage.